The pH of concrete-based material is a key parameter for the assessment of its stability and durability, since a change in pH is usually associated with major types of chemical degradation such as carbonation, leaching and acid attacks. Conventional surface pH measurements with potentiometric flat surface electrodes have low spatial resolution, whereas optical pH visualization with indicator dyes (phenolphthalein) only indicates the areas with higher or lower pH than the pKa of the indicator. In this regard, it is key to develop wide-range imaging systems, enabling accurate and spatially resolved determination of pH variability for an advanced knowledge of degradation mechanisms. This contribution presents the enhancements made for a high-resolution optical pH imaging system based on fluorescent aza-BODIPY indicator dyes. The measurement range was increased to 6 pH units (pH 6.5 to pH 12.5) by a combination of two indicator dyes. Moreover, background scattering effects were sufficiently eliminated. 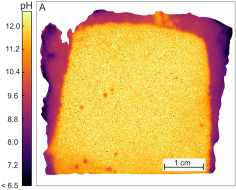 With the improved sensor foils steep pH gradients (up to 3 pH units within 2 mm) were successfully recorded in various concrete specimens using a macro lens reaching a resolution of down to 35 µm per pixel. Müller, B., Grengg, C., Schallert, V., Sakoparnig, M., Staudinger, C., Breininger, J., Mittermayr, F., Ungerböck, B., Borisov, S., Dietzel, M. and Mayr, T. (2018) “Wide-range optical pH imaging of cementitious materials exposed to chemically corrosive environments”, RILEM Technical Letters, 3, pp. 39-45. doi: 10.21809/rilemtechlett.2018.72.